Appearance: Standing at 5’10”, he has dark beige fur and is slightly strong-built. No markings to mention. Clothes: He tends to keep his clothing rather simple. You’ll always find him wearing leather shin guards and gauntlets along with a leather waist support. He also wears a bluish-purple coat that always displays his leather-wrapped waist, a purplish waist flap that even displays his grayish loincloth, and a red sash that secures his flap around his waist. One small feature is that he has a long ponytail extending from the back of his head secured by a red band. Strengths: Proficient in sword and hand-to-hand combat and is an all-around team player in assisting others in need during battle. Weakness: Can overexert himself in the heat of battle which will tire him out easily if not careful. Prone to cockiness when feeling over confident in his abilities when assessing his situation in battle. 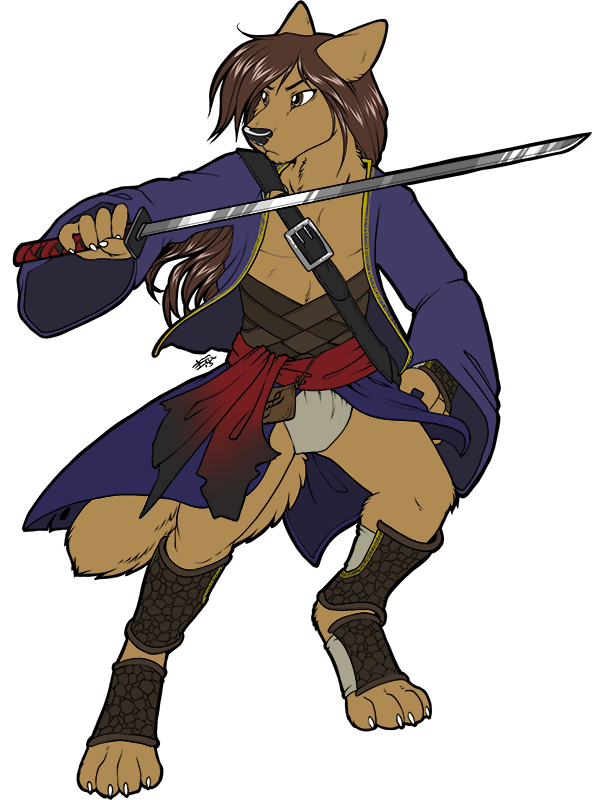 Weapons: He is currently armed with a medium-length katana and is very proficient with his swordsmanship. However, he is deadly when using his hands and feet in hand-to-hand combat. Raul Xi hails from a secluded area on Orchid Island. At age 25, he has known very little about the world outside of what he has known. His parents came from opposite sides of the North Star Island (his father coming from the Western half while his mother coming from the Eastern half) and were very fortunate to have done their best by keeping young Raul from being sold to slavery. After being taught how to read and write, Raul was very diligent when it came to training in hand-to-hand and sword combat. He showed no sign of ever quitting since he wouldn’t let any slave trader come near him. Raul left his parents at age 20 when they saw that he could take care of himself. Five years has passed since he has left his parents. He found himself a cottage where he could train his combat skills in peace. Raul has even offered to train people ranging from pre-teens to their early adulthood. He has grown to be a very likable wolf because of his often carefree yet understanding personality. He will even joke around when given the perfect opportunity. When there is someone in need of assistance, Raul is always there to lend a helping hand and is always determined to take on a challenge. Others rarely criticize for what he does, but there have been times when Raul has made a few errors in some challenges he’s faced. He will always take the criticisms to heart whenever there is one to be made. For awhile now, Raul Xi has been wanting to go out on an adventure and see what the world has to offer him. He knows that the road ahead may be intimidating at first, but he is willing take on the challenge. What friends and foes will he meet? Only he will find out.